Robert Carter passed away in San Antonio on September 27, 2016. Robert’s service will be at 10:00am Saturday, October 1 at Castle Hills Christian Church, 6209 West Ave in San Antonio, TX 78213. Robert Carter was a loyal and frequent Texas Pro Sedans driver at most all tracks and road courses on the TPS schedule. For many racing seasons Robert worked as a TPS race official He served as the TPS Race Director for two years. He is survived by his wife Becky who also assisted from time to time as a Texas Pro Sedans scorer and administrative assistant. The Texas Pro Sedans expect to dedicate the October 22nd race at Central Texas Speedway to the memory of departed TPS member Robert Carter. Robert was one of the most likable people you would ever meet. And a pretty decent race car driver and an even better race official. He will be missed by all who knew the man. I couldn't have said it any better Nick. Robert W. Carter, age 69 of San Antonio went home to the Lord Tuesday Sept. 27, 2016. He was born to C.W and Billie Carter in Lawton, Okla. on Nov. 27, 1946. He attended Crooked Oak High School in Oklahoma City marrying his high school sweetheart Rebecca Dyson before enlisting in the U.S. Army and leaving to serve as a medical corpsman during the Vietnam conflict. For his service he was awarded the Bronze Star among other honors. After being discharged Robert went on to study Civil Engineering at the University of Oklahoma and pursued a lifelong career in the construction industry with 30-year association with Lyda Builders of San Antonio. 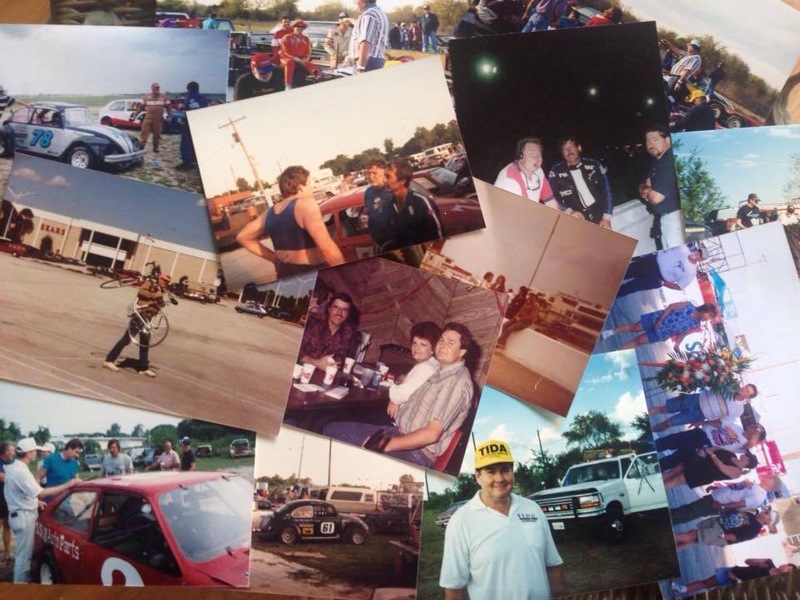 He had a passion for racing which included motorcycles, stock car racing, demolition derby, eventually driving race cars and officiating racing events. He incorporated his passion for charity and was instrumental in the establishment of the Respite 500 Mini Grand Prix of San Antonio which became an annual event for years. Robert Carter was a driver, car owner and Texas Pro Sedans Official for most of TPS's 41 years of operation. Following his baptism in 1990, Bible Study Fellowship became an important part of his Christian walk. His retirement enabled him to participate in spending more time with ministry and he totally enjoyed teaching a Sunday School class of two and three-year-old children with his wife at Castle Hills Christian Church. He retired to his dream of a cabin on the lake, and pursued interests in the outdoors, especially fishing, and kayaking. HE IS SURVIVED by his wife, Rebecca, daughter Robin Greig (husband Thomas), children Emma, and Ian of Charleston, South Carolina and his father C.W. Carter of San Antonio. He was preceded in death by his mother, Billie M. Craddock. In June of 2015 he learned that he had cancer and immediately began chemo; he endured without any complaints. Through his faith, cancer gave him the opportunity to witness to others. A celebration of his life will be held at Castle Hills Christian Church, 6209 West Ave. San Antonio, TX at 10:00 AM on Oct. 1, 2016. Note: Speakers at the service will include Texas Pro Sedans Driver Mike Knotts and TPS Official Neil Upchurch. Texas Pro Sedans drivers and former drivers attending Robert Carter’s Memorial Service held in San Antonio on October 1, 2016 were: Mike Knotts, who presented one of two obituaries, Bruce Mabrito, Rick & Claudia Dawdy, John Leonard, Jesse Sandoval and TPS Official Neil Upchurch who wrote and presented parts of this tribute. Roberts wife – Rebecca Carter called Neil and asked that I offer a tribute at Robert Carters memorial funeral. My name is Neil Upchurch. I founded a 4 cylinder racing sedan class called the Texas Pro Sedans 41 years ago. I’ve been a Texas Pro Sedans official and one of many persons who have dedicated their time and talents to maintain TPS racing operations of more than 600 races in 41 years. Until Tuesday of this week, there was another auto racing gentleman, a race car driver and later, a racing official who has dedicated a lot of his time and talent to maintain Texas Pro Sedans operations for many of these 41 years. His name … Robert Carter. Robert was a friend to many TPS members. He was my dear friend and was a huge help in keeping TPS going for as long as he could keep going. Robert didn’t meet his maker in a race car crash. That terrible thing known as cancer took him from us. As many of you know and some believe, Robert, the Texas Pro Sedans race car driver has passed from this life to a much better racing facility called heaven. Robert Carter is remembered by many of those in the grandstands as the driver and car owner of the silver #73 and #61 Texas Pro Sedan Volkswagen air cooled racing sedan. He competed in more than 100 TPS races at such tracks as San Antonio Speedway and at Longhorn Speedway in Austin, at Thunder Hill Raceway (now known as Central Texas Speedway) in Kyle, Texas, down in Corpus Christi Speedway and in the TPS support races to the Texas Race of Champions at Texas World Speedway in College Station. He drove the red VW Scirocco Pace Car at TWS too. And he raced in several 24 hour races at the Autodromo of Monterrey in Mexico where Robert and his other co-drivers Ed Stanley and Fisher Jones, all of San Antonio, took on one of a few remaining longest races in the world. In order to have an appropriate racing farewell for Robert, the final race of the 2016 TPS racing season will be held at Central Texas Speedway in Kyle, Texas on Saturday, October 22nd. The event will be dedicated to Robert’s memory. Many Texas Pro Sedans drivers, crews and officials will assemble that evening on the starting line. Nearly all of them knew and were friends of Robert. Although they will be racing with heavy hearts, they will be racing on Saturday, October 22nd in respect to Robert’s memory. The Texas racing community is keeping Robert and his family in their best thoughts at this difficult time.